Vista Hills Elementary School, home of the Crusaders, was built in 1977. Currently a Title One School with a student population of approximately 650 students, our school proudly serves students in PPCD and Kinder through 6th grade. There is a bilingual section in each grade level that serves our bilingual population. It is located off Lomaland and La Subida Dr. School colors are red, black and white. We are a feeder school to both Desert View Middle and Hanks High School. Vista Hills goal is to develop the "whole child." Student success has always been a tradition here at Vista Hills. Ysleta's EngageMe Initiative provided all 3rd through 6th grade with either a HP Stream or Chromebook for instructional use. Vista Hills has taken that same initiative and provided all 2nd grade students with their own Chromebook. Computers on Wheels give students in Kindergarten and First grade the same opportunity to have access to a device for instructional use. Students use Google Classroom to turn in their projects they have created using either Google Draw, Docs, Slides or Sheets. Thus preparing our students for the 21st Century. Fourth and fifth grade students participate in a Research Based Instruction (RBI) Fine Arts Program: a research based program with a component that most programs do not have, and that is integration of fine arts. It also integrates a curriculum where they could teach their disciplines within the classroom. Each grade level focuses on a thematic unit which gives them an opportunity to research, sing, create projects, write reports and present oral presentations. In 2017 Vista Hills implemented an active STEAM lab incorporating Science, Technology, Engineering, Science, Arts and Math into the school curriculum. This has added a 21st Century dimension to the activities on campus. Band and orchestra is offered to students in 5th and 6th grade. For the past several years these programs have received many awards including superior ratings at band and orchestra competitions. Vista Hills also offers numerous extracurricular activities beyond the classroom such as: Crusaders w/Character was established in the 2017-2018 school year as an anti-bullying and kindness club. The purpose of the club is to promote kindness among each other and reduce bullying. As a club the students participate in school activities that encourage students to make right choices in life and at school. The club currently has 76 participants and 10 student leaders composed of 5th and 6th graders. The leaders get experience in managing a group of students and delegating task to their assigned group. Excalibur A service club available to students in grades 3 - 6. Membership is open to all who meet the requirements stated: Complete 6 school services and 10 community / home services every 9 weeks. All services are voluntary -- not for pay. Maintain a 75 and above and E’s or S’s for conduct on all report cards. Attend club meetings (One meeting / month). Demonstrate character traits such as Responsibility, Respect, Honesty and Kindness. Volleyball, basketball and chess are other activities offered afterschool. Yearbooks are on sale for $30.00 through April 19, 2019. Be Here! Every Day. All Day. All the Way!!! Congratulations Ms. Cynthia Frederick for being named 2018-2019 Teacher of the Year!! K-6th grade students participated in a Fairy Tale Math & Science Night. 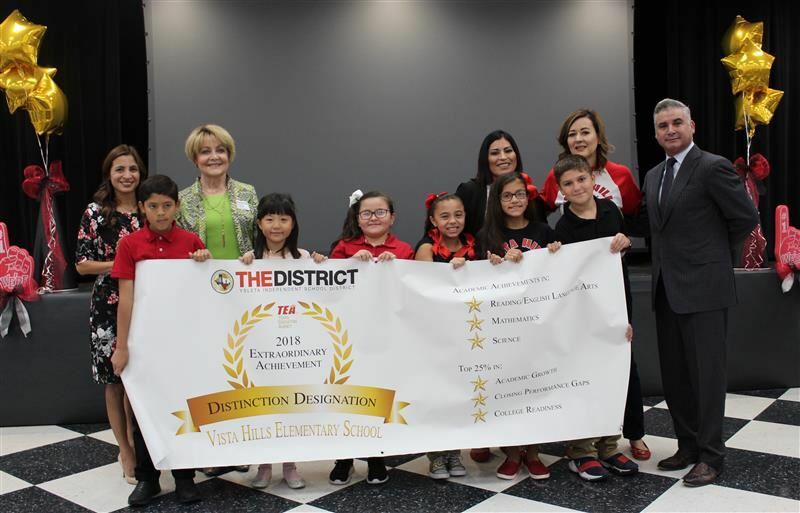 Vista Hills was presented with the 2018 Extraordinary Achievement "Distinction Designation" Award for their Academic Achievements. Leadership Team and students Hearts Grew Three Times at Vista Hills during Hank's Homecoming. Second grade students learn how to work together using IO Blocks as part of PLC. Students get treated to an ice cream sundae for their hard work. What a great way to start your Friday morning, grandma and grandson. Grandparents enjoy some quality time with their grandchildren. Grandparents are treated to a story and treats. Fire Dept. & Police Dept. explain the importance of their jobs to students. Community members volunteer their time to share their profession with students. Kindergarten students dress up for Career Day.